An action packed race for the Lotus F1 Team today, with disappointment for qualifying star Romain Grosjean, who retired after contact with Williams driver Maldonardo in the early stages terminally damaged his suspension, while Kimi Räikkönen raced through from 17th on the grid to finish a strong 7th, helped by an incident packed last lap. 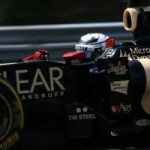 Discussion: SELOC Chat – 2012 F1 race – Who’s up? This entry was posted in Lotus F1 Team and tagged Australian GP, F1, Interview, Kimi Raikkonen, Lotus F1 Team, Race Report, Romain Grosjean. Bookmark the permalink.